Choosing a large wood stove? This is one of the most popular models and a true performer. The Jøtul F 500 Oslo wood stove features both front and left side-loading convenience to go with its legendary non-catalytic clean-burn combustion efficiency. 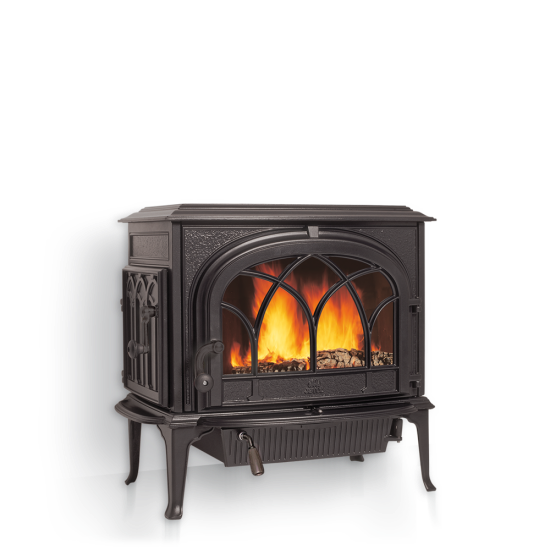 With its signature Gothic Arch design and large fire viewing area, the Jøtul F 500 Oslo is the the best selling non-catalytic cast iron wood stove in North America. Jøtul is one of the world’s oldest producers of stoves, inserts, and fireplaces. Building on a proud Norwegian heritage, we have combined fine craftsmanship with the art of coping with the cold for 160 years.